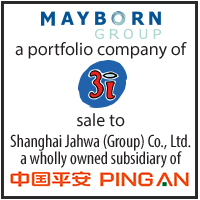 Exclusive Financial Advisor on the Sale of Mayborn Group, a portfolio company of 3i, to Shanghai Jahwa (Group) Co., Ltd. Following its investment in Mayborn Group, owner of the award-winning global baby brand Tommee Tippee, 3i supported the Company in a strategy to internationalize its operations and develop a world class newborn-feeding franchise. After significant success with this strategy, 3i selected Baird to sell the Company and find a new partner who could facilitate the next phase of its international growth journey. Baird was selected for the role because of its global platform, strong strategic and financial sponsor buyer access, deep juvenile sector experience and outstanding track record selling iconic consumer brands for premium outcomes. A combination of Mayborn’s global growth potential, particularly in the U.S. and Asia, strong brand, resilient and cash generative business model and leading market positions drove strong interest from a diverse and global mix of buyers. Baird successfully supported the Company in cultivating that strong interest and funneling it through a competitive process where each buyer’s strategic logic was carefully developed. Ultimately, Shanghai Jahwa was the successful buyer, with the deal representing its first international acquisition. The strategic combination will open an exciting opportunity for Mayborn to leverage its iconic Western brand in the vast Asian juvenile market.